Starring: Dacre Montgomery, Naomi Scott, RJ Cyler, Ludi Lin, Becky G., Elizabeth Banks, Bryan Cranston, Bill Hader, and more. My oh my, can I just tell you how much of a Power Rangers addict I was when I was just a wee little lad? I was a Power Ranger for maybe three straight Halloween’s (shout out to the White Ranger, he was two of the three). I watched every season until about 2000 until Lightspeed Rescue. 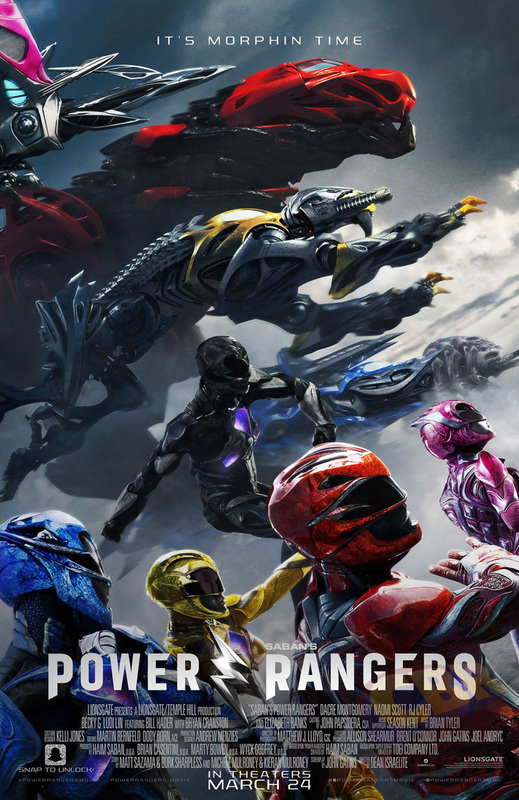 Now, a remake is upon us of the famed original Power Rangers and the little kid in me is HYPED… but, that is the kid in me, how does the film fan take in this remake? This is a battle of logic vs. nostalgia and to be honest, I do not know which won. A band of misfit teenagers find themselves imbued with superpowers when they stumble upon ancient coins buried within the ground. Not only are these coins harnessing superpower, but also the abilities to become Power Rangers and ultimately the ability to combat great evil. So again, I was hyped to see this movie. My childhood was going to be relived with this new take on the original series and to be honest, I was pretty satisfied with what I saw by the time the movie came to an end. Characters I loved in new form, a dope new style of armor (which has been hotly debated but how is that a turning point for a movie being bad or not? Piss off), and quite an entertaining bit of material throughout the film in regards to comedy and action. So no doubt, ‘Power Rangers’ was an entertaining film from my perspective. However, everything was not all rainbows and butterflies. The story progression was sporadic throughout the film. I felt as if the film had a hard time balancing the whole serious tone and the imminent Earth’s destruction between the OhEmGee teen drama that was supposed to instill a deep emotional heart-string pluck (although I did feel for Zack (Ludi Lin) the Black Ranger because I’m a mommas boy). Let us also not forget the music video film constantly blaring out mainstream tunes at inopportune moments. Sorry, the last thing I want to listen to is Kanye West’s “Power” while an intense battle scene is going on. So beyond all that and other personal gripes I had with the film, I do want to bring focus to the characters. I had no previous knowledge of any of the actors and actresses besides Becky G (Trini/Yellow Ranger) being a musician and me loving RJ Cyler (Billy/Blue Ranger) in the film ‘Me, Earl, and the Dying Girl’. RJ Cyler easily stole the show. From the moment he entered the screen, I loved every moment of his screen time… Discount Zac Efron aka Dacre Montgomery (Jason/Red Ranger) was a solid player in the film. I was not entirely thrilled with his role of the leader but I hope to see better from him with the expected coming sequels… Naomi Scott and Ludi Lin (Kimberly/Pink Ranger and Zack/Black Ranger) were average for me. I was not a fan of Kimberly’s story and Zack was a bit of annoyance but they were nothing perspective altering for me… Lastly, Elizabeth Banks as Rita Repulsa was actually impressive for me. I enjoyed her quirky persona and was actually shocked by the way they presented her at times through almost a horror type way. Very cool for me… Again, overall, solid cast choice and performance for an intro film. So here we are. To be honest, I am mostly at a split with the film. Although I can not deny it was an entertaining bit to watch. I would definitely recommend a watch for people interested in the film but prepare to be on either side of the spectrum by the film’s end. You will either like it or hate it. Overall, I was entertained barring some childish antics within the film. But a bright future ahead for this film series. Posted in 2017 Movies, Movie Review.Tagged Becky G, Bill Hader, Bryan Cranston, Dacre Montgomery, Dean Israelite, Elizabeth Banks, Ludi Lin, Naomi Scott, Power Rangers, RJ Cyler.